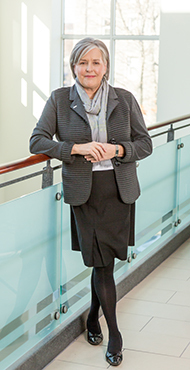 Patricia Bradshaw (ICD.D) completed her term as the Dean of the Sobey School of Business at Saint Mary’s University in June of 2018 and is currently a Professor of Management at the University. She previously worked at the Schulich School of Business at York University and while there was the Director of the MBA Program and Chair of the Senate. Her research interests include the study of organizational power and politics, gender and nonprofit boards of directors. She has consulted with numerous nonprofits and her consulting projects include governance workshops, strategic planning, team building for boards and staff and training programs on change management and critical thinking skills. She has served on the board of the Association of Researchers in Nonprofit Organizations and Voluntary Associations (ARNOVA) as well as the board of Altrusvest and the Canadian Center for Ethics in Public Affairs. She is currently a member of the Community Council of Nova Scotia Board as well as the boards of APEC and Scotian Wind.